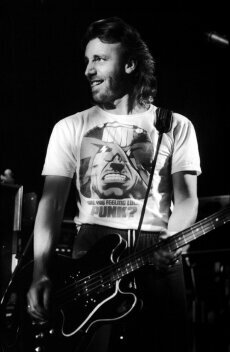 Brit guitar legend Peter Hook proudly wore his 'Are You Feeling Lucky Punk?' 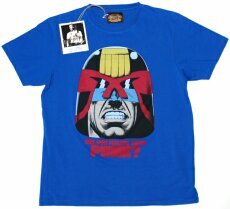 Judge Dredd T-shirt whilst touring with New Order in the 1980s and now you can get your hands on this faithful reproduction. Dedicated to recreating garments once worn by icons of the past, Worn By uses original photography to recreate vintage T-shirts that genuinely capture iconic moments in time. With a classic range that encompasses the worlds of music, film and sport; Worn By T-shirts celebrate the iconic heritage of the 60s, 70s and 80s with a distinctive modern edge. The new limited edition design is part of Worn By's 2007 range, and comes in both blue and grey and is available in all sizes for both men and women. 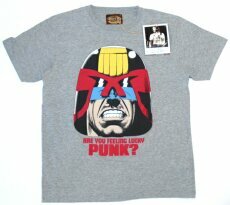 The T-shirt is now available from the Worn By online store, www.wornby.co.uk for Â£40. The ladies' design is also available in Urban Outfitters. Profits from the T-shirt sales go to Staying Alive; a multimedia global HIV and AIDS prevention campaign that challenges stigma and discrimination associated with HIV and AIDS as well as empowers young people to protect themselves from infection.